Netafim 2" 4 spring pressure regulator @25 psi | Wyatt Irrigation Supply, Inc.
Pressure Regulators are manufactured with non-corrosive, high quality plastic and brass, that withstands all fertilizers and chemicals in common use providing years of trouble-free operation. 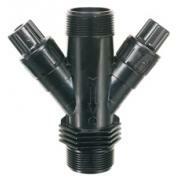 The one-piece sealed regulating unit - different for each pressure option - is field replaceable and easy to maintain. 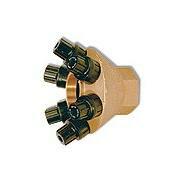 Available in several sizes, pre-set pressures, and flows from .25 to 175 GPM. Provides instant response to variations in pressure assuring that outlet pressure will remain constant regardless of inlet pressure. Preset with flows from .25 to 175 GPM. Regulating unit has stainless steel spring and screw and EPDM rubber diaphragm creating a tight seal eliminating leakage. 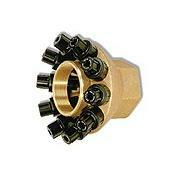 The rise versus the decline in outlet pressure has significantly decreased ensuring better hydraulic performance. Built-in operating indicator visually shows when proper outlet pressure is achieved. 3/4” Low Flow is an in-line unit with female threaded connections, silicon diaphragm for no leakage and is sealed to regulate accurately at low flows.